I am not 100% sold on the cupcake recipe, but I like the flavor combination and want to work on something similar, but perhaps with a fudgey texture. The other components, however, worked out fine. Chockylit: Great job with matching flavors. Can’t wait for the PDF. Definetly a keeper. I would likt to see more of that kind at your cupcake bake shop. This is a great blog. Gorgeous pix and fantastic recipes. Yum. I’m glad I stumbled onto this. Cheers! latifa, its funny you asked… i got the pdf idea from 52cupcakes and was wondering how she did it. i noticed that her recipe files were being delivered from a personal website. i have a personal website too, so i ftp’d the recipe files there and provided the link on the blog. i don’t think blogger provides this functionality at this time. hey – these look amazing! is there anyway to omit the peanut butter filling without taking out the taste? okay, that drizzling glaze photograph is almost more than I can handle. 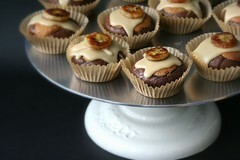 Now I have to make these AND the ginger-lychee cupcakes this week. Gluten-free versions, of course. Sheesh. You keep me busy! I just used this peanut butter filling as the center of some incredibly rich chocolate cupcakes, frosted with a Nutella buttercream. Perfect pairings. My first time ever making cupcakes… these chosen as they are all of my wonderful hubby’s favorites. Simply put, worth the time. He raved and the cupcakes I boxed for work went in minutes. Thank you for pulling together such a delish and creative recipe! I just made these this afternoon! I am so glad I stumbled upon your Cupcake blog! Thank you so much for offering these wonderful recipes to all of us! I tried these last weekend. Everyone loved them. 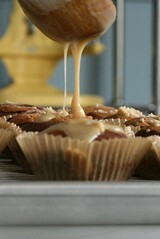 I used my greatgrandmothers recipe for carmel icing because it is a lot eaiser. I would up the banana next time I really didn’t taste it. More like a yummy choc. peanutbutter brownie. Great website and pictures!!! hi i would like to ask if the caramel glaze gets sticky if i leave it at room temperature? wow! made these today for my husband’s birthday and they were such a hit. absolutely perfect. I made these tonight and I wasn’t terribly impressed, there wasn’t much flavour to them. I love your blog!! thanks for sharing, all your cupcakes look divine!! oh what a amazing blog adorned with loads of cuppys all around place-yummy yummy yum. i have tried 2 of ur wonderful recipes for this months i heart cuppys & boy am i glad,iso enjoyed the making and though my cuppys didnt taste half as good as urs ,every body relished ‘em. infact i usually keep aside a little of what i bake for the poor who’d maybe not indulge in these goodies and am so happy to see ‘em smile. I have linked back to ur site too. i made these when you first published them and they were a huge hit in my family. 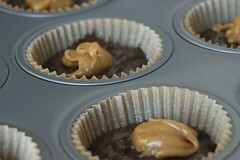 today i’m making them for my new in-laws and i know everyone is gonna love them, my fave cupcakes !! I halved this recipe (with b. soda) and got rave reviews for it at my daughter’s 3rd birthday party today! 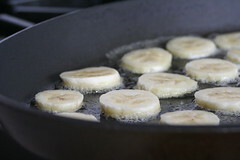 Next time, I’d add a bit more banana, as they were worryingly dry/hard on top. 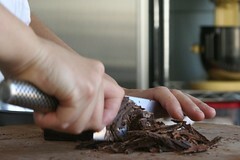 Inside, they were rich and tasty, bordering on fudgy, but I’d like a little more moisture. They were not that hard or time-consuming to make! And when she says to cool the icing slightly, that is about 10 seconds of cooling! I left it for maybe 2 minutes, and it was completely set. I rewarmed it in a hot water bath, added some milk (I used 2% and not half/half), and still had to rewarm it between icing each cupcake. I didn’t halve the PB middle since it called for a single egg. I baked the leftover PB mush in a greased ramekin for maybe 15 minutes. I melted some chocolate chips on the top and had a lovely peanut butter souffle thing. Bonus! I just stumbled upon your site this week and I can’t stop looking at it! 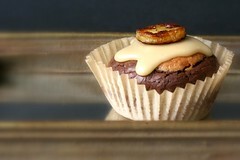 I’m trying to download this recipe, but it keeps taking me to another site (www.cupcakebakery.com). Is this right? yeah that’s my old site where i was hosting the PDFs. they don’t exist anymore. sorry!